Inniskillin is perfect for pairing. As Canada’s Original Estate Winery, we are a respected winery pioneer committed to producing premium wines from premium grapes grown in Canada for over 35 years. With Wineries in both Niagara-on-the-Lake, Ontario and the Okanagan Valley, British Columbia, Inniskillin offers a full collection of world renowned, award winning VQA table wines and iconic Icewines made by progressive, artisanal winemakers. 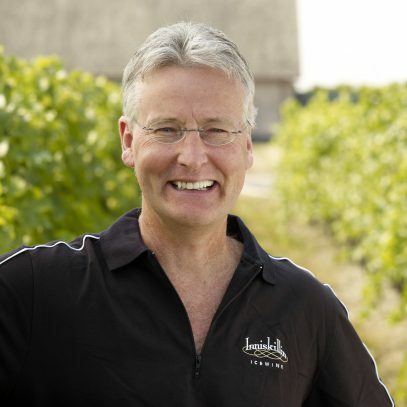 Bruce Nicholson joined Inniskillin Wines, Niagara-on-the-Lake as Winemaker on January 1, 2007, after an outstanding career in the British Columbia where he was Senior Winemaker for Jackson-Triggs Okanagan Estate. Born and raised in Ontario’s leading wine region, the Niagara Peninsula, Nicholson was intrigued by the winemaking industry from an early age. After studying Sciences at Ontario’s Ryerson University and University of Windsor, Nicholson apprenticed in winemaking in Niagara before heading to Western Canada. Ironically, he had approached Inniskillin co-founder Karl Kaiser to inquire about a job in the Niagara wine industry, but as fate would have it, the job did not materialize. Despite that, Nicholson ultimately came full circle and he now leads Inniskillin’s winemaking team. I love how Chardonnay shines with rich, defined structures from the good natural acidities in our Niagara cool climate.